The GSMA's Mobile Education project (launched in early 2011 with the objective of addressing market barriers and accelerating the adoption of Mobile Education solutions around the world) has recently published a paper "The Mobile Proposition for Education" and other interesting papers downloadable from http://www.gsmaembeddedmobile.com/mobile-education/ describing some key educational scenarios where the use of mobile-enabled handheld technologies can deliver significant benefits. It also describes the assets and expertise the mobile ecosystem (i.e. mobile network operators, handset manufacturers, systems and solutions providers) can offer to support education. These scenarios are illustrated with real world examples of how mobile technologies are transforming teaching and learning in many contexts and countries. For those interested, there is also a report on the mLearning landscape, focusing on mLearning in Japan, France, Spain and UK, with examples from these areas. That report can be viewed here. GSMA is still looking for mobile education case studies and educational institutions which would be interested in working with mobile network operators on pilot projects. So get your bid in! To find out more about the project and to share your mobile education experiences, good practice and ideas please contact / email mobileeducation@gsm.org. Stephen Downes is one of the key knowledge persons in my learning network. He has a wonderful information harvester (gRSShopper, which I am going to integrate as soon as I get it running - almost there and I will gladly share it once it is up and running). Stephen sticks to the principle of open / free learning and ... he builds his own path in life (a very tough path to walk on). To me Stephen Downes is to learning what Henry Rollins is to music, they simply to their thing and if you don't like... so what. Great spirit. Although I have been reading what Stephen shared for years, this was the first time I could hear him in real life. And it was enlightening. I do not know why, but sometimes I need a synchronous physical location to come to the next level of understanding. I sometimes think the physical presence of a brain connects to other brains in the room. Let's say a synapse dynamic that surpasses the neurons in the personal brain but can jump in between other brains ... well, strange beliefs make good dreamers. In his presentation he focused on the difference between what he saw as free learning, and where Open Educational Resources (OER) and its propagators stand. That topic is of interest as I got involved in some conversations three months ago with the people of OERu. Stephen made some very interesting points in that the people of OERu still work with a model that is based on the industrial educational model: assessments (multiple choice, etc. 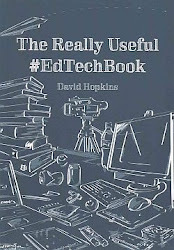 but assessments seldom indicate the state of knowledge within the learner), they allow accreditation, but only from institutes within the federation around OERu ... What Stephen suggested was that free learning assessment should be by engagement, assessment by community impact so to speak. Great idea. He proceeded to say that learning is a matter of growth, not accumulation (agreeing with that, each day a learner will proof that the whole is bigger than the sum of its parts. And that our knowledge is distributed across neurons, it is not fixed. This is a statement he made years ago, but I am only starting to feel the implications of this sentence as I relive it day by day. At times I really think the universe can be brought back to a simple set of interchangeable rules and one is ... growth, which is essential to learning. Personal Learning Environments (PLE) have been hot news for a couple of years now. And with the proliferation of all things social media, they have become a highly personalized and very functional application for any knowledge worker. A PLE will enable you to work more focused, keep an overview of all the information that comprises your knowledge and be able to share with others whenever needed. My PLE is not very well structured to say the least, in fact chaos is my middle name when it comes to PLE. But I can no longer postpone the (re)structuring of my PLE for the simple reason that I am increasingly engaged in various projects that demand slightly different foci. So with increased research efforts coming along, presentations lining up and a major course that needs to take shape, I want to get my PLE straightened out. Luckily, I met Steven Verjans earlier this week during the Vlhora studiedag. And as fate sometimes wants it, his topic of the day was PLE. Not the dry stuff of PLE, no a personal narrative showing his PLE and what a wonderfully structured knowledge universe he has created! Steven is a rock in my eLearning ocean. We do not meet at regular intervals, but I know he is one of the knowing. He simply keeps on moving forward with eLearning, he is always balanced and he really has his PLE in order. He combines lists in twitter (and uses twitter a lot as backchannel), diigo bookmarks in network forms (he switched from delicious), netvibes overview pages and a nicely linked set of flickr, summify.com (and paper.li), researchgate.net (and academia.net). Steven calls twitter a stream of information, in which you can dip your tow whenever necessary and after you have found what you want, you simply move on again. If you want to structure your own PLE, have a look at the slideshare of Steven (presentation notes in Dutch, but media in English), he has wonderful ideas or simply have a look at his netvibes page. What a thrill it has been. At the beginning of 2011 I got the idea of organizing a mLearning course, simply because there was no open and free course available. Taking up the Massive Open Online Course format to design the couse felt logical. The course was entitled MobiMOOC and ... off it went. After the six weeks course there was a certain inspiring dynamic, so I wondered if anyone would be willing to co-author a paper and six other people immediately stepped to the plate, and of course these are all fabulous people. So we are now seven members in the MobiMOOC research them (alphabetical order): Sean C. Abajian, Michael Sean Gallagher, Rebecca Hogue, Nilgün Özdamar Keskin, Apostolos Koutropoulos, Osvaldo Rodriguez and myself Inge de Waard. Writing the paper was a very dynamic process. After various iterations, where all of our combined ideas were put into the paper, we came to a consensus and ... the work and friendly, inspiring collaboration payed off. 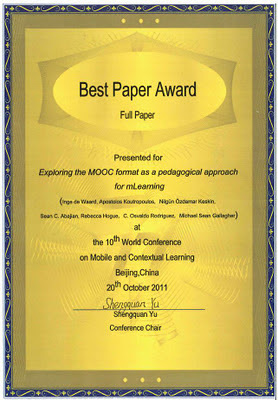 The team got 'Best Paper Award at the academically prestigious mLearn conference in Beijing. We all feel this is a true honor, as the paper came out of a thorough peer review process. I have uploaded the conference paper to academia, you can also download the conference paper here. The wonderful thing about the MobiMOOC research team is that it is an informally build group. 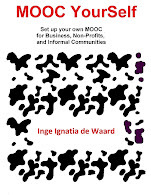 We just got together and started collaborating on a joint interest: MOOCs and mobile learning. It was uncharted territory. The international dimension of the group adds to the diverse perspectives and - at least for me - it has been enlightening. The great thing is, the mLearn conference full papers also get published in a peer reviewed mLearning journal iJIM, so ... we are all excited! Michael Sean Gallagher, Rebecca Hogue and Nilgün Özdamar Keskin were at mLearn2001 and they gave the presentation accompanying the paper. I gladly share their presentation here. If you are part of an educational organization (institute, ngo...) the HASTAC/MacArthur foundation offers a nice way to get your educational idea based on lifelong learning scaled up thanks to their support. So get your stage one application in order and send it out. You do not need to be based in US to take part in this competition. The Fourth HASTAC/MacArthur Foundation Digital Media and Learning Competition is now accepting Stage One applications from institutions/organizations with compelling learning content for which a badge or set of badges would be useful for recognizing and making visible learning that takes place in a particular area or topic. Stage One applications are now due November 14th, see information below. This year’s Competition, held in collaboration with the Mozilla Foundation, focuses on badges for lifelong learning and explores digital badges as a means to inspire learning, confirm accomplishment, and/or validate the acquisition of knowledge or skills. The Badges Competition is designed to encourage the creation of digital badges and badge systems that support, identify, recognize, measure, and account for new skills, competencies, knowledge, and achievements for 21st century learners wherever and whenever learning takes place. It is comprised of three stages, with finalists being chosen in Stages One and Two, and ultimately forming a collaborative team in Stage Three. It is this collaborative Stage Three proposal that is subject to award. Institutional/organizational applicants from outside of the United States are welcome to apply in any stage. Who should apply: Institutions/organizations/legal entities from any sector and of any size--from a small non-profit to a large corporation--with compelling learning content, activities, or programs for which a badge or set of badges would be useful for recognizing and making visible learning that takes place in a particular area or topic. Who should apply: Organizations, teams, or individuals skilled in the design of badge systems and implementation of badge technology. These applicants will focus their designs on the content and programs proposed by either Stage One applicants or Digital Media and Learning Competition collaborators. No application needed--finalists from Stages One and Two will be selected to advance. Stage Three pairs Stage Two finalists with Stage One finalists and/or collaborators, to form comprehensive teams who will work together to finalize collaborative badge proposals. The Research Competition focuses on online networks, digital resources, and gaming environments that provide rich opportunities for demand-driven, learner-centered learning. These include networked knowledge communities, online tutorials, and other digital resources for wide-ranging learning needs. We invite you to learn more about open badges and this Competition during a series of interactive webinars hosted by the Mozilla Foundation and the HASTAC/MacArthur Foundation Digital Media & Learning Competition. Limbanazo Kapindula (Twitter: @Limkapin) has come to ITM to help us out in setting up a mobile diabetic project (will report on this later) in Cambodia, the Philippines and the Democratic Republic of Congo. He comes all the way from Malawi where he was involved in three 5 year projects with Management Sciences for Health, they all came to an end in September 2011 (5 year projects). This is a short synopsis of his presentation. 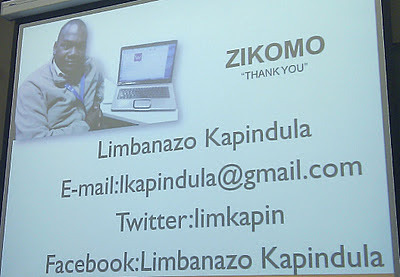 Limbanazo is an IT expert, and he gave the mobile phone training to people who had never used mobile phones before. Challenging infant mortality rates (69/1000 children die in the first year) and only 40% of women in Malawi had access to family planning services. So how can the access to care be increased? How can community workers be helped? Community based distribution agents providing oral contraceptives HIV/AIDS. 13 of the 28 Malawi districts were targeted. Planning the backup (data backup for future support). A network between central computers that are connected via USB modems for data transfer, connected with Frontline Medic sms (enables bulk message interactions between a central location and people across any region, setting up forms, connect to patient database). It was a simple application, so simple that it could be learned from a manual. It took three months to fit the project to the scientific demands of the researchers (java reader, specified forms), but the actual use was really easy thanks to this pre-project input, nevertheless there were some people who simply were not able to cope with the technology and they dropped out due to the pressure to keep reporting (those were mainly part of the community based distribution agents, which are volunteers). Over 12000 text messages captured using the system within 8 months (WAW!!!). 50% of the messages was on technical information, 35% on patient reports (this division was connected to the startup of the project, dialogues between health care workers). These distinctions in the mobile communication could be recorded because they used keywords for specific communications. Cost was a main concern for the government, after taking into account all the data, the project showed that with only 10 cents a child’s life could be saved. 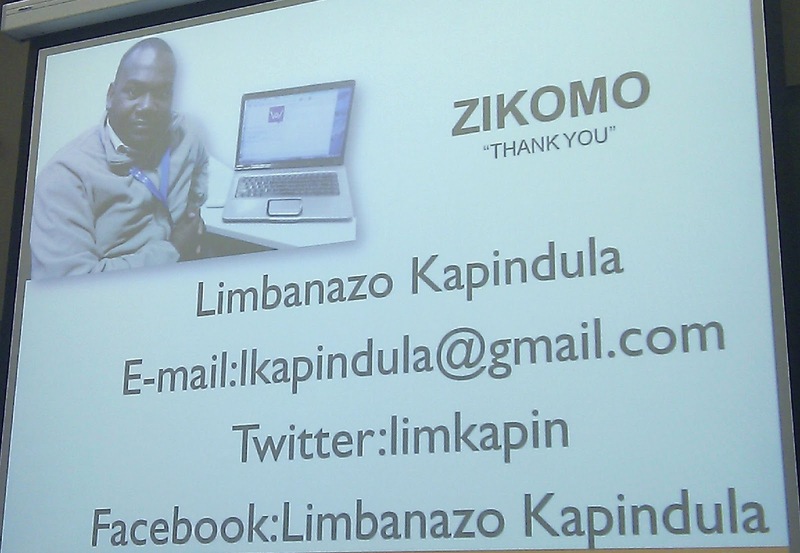 If you are interested in setting up a mobile project in any region that is based on simple phones, contact Limbanazo who has all this expertise. Or take a look at the program that was used and check it out yourself. 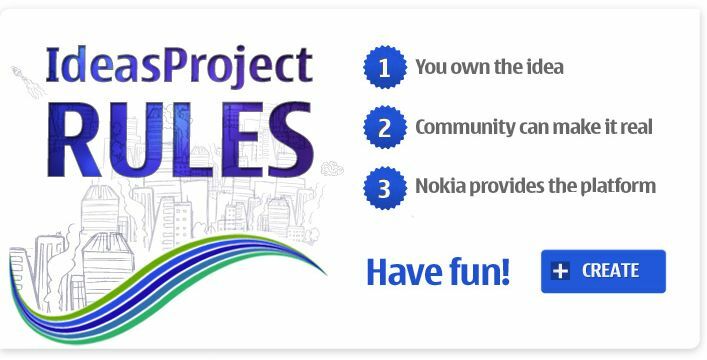 A consortium involving Nokia, the Pearson Foundation and UNESCO have launched an “Education for All” crowdsouring challenge: “an eight-month initiative to elicit suggestions on how mobile communication can help achieve EFA goals.”. The aim is to develop suggestions emerging from an interaction between education experts, teachers, parents, students and software developers. Each month will feature a separate EFA goal. The first month is devoted to finding solutions on how mobile communication can help achieve literacy. Prizes will be awarded monthly to the best ideas, chosen by a panel of judges.Monthly smart phone prizes will be awarded to the best ideas recognized by the panel of judges. The best ideas will be published and celebrated also in the UNESCO websites to explain their proposal in further detail and to encourage the development of the ideas into concrete projects. 31/05/2011 - End of EFA Crowdsourcing Challenge. Informal learning is one of the key topics in this knowledge era. We all use it, and informal learning comes as natural to us human beings as eating. If this quest for knowledge is rooted in each one of us, it starts from the moment we are babies. Ever since I became a parent (four months and a half now) I have been wondering at times why I put in that much effort into this small baby that barely gave me any signal of recognition in the beginning. But although I did wonder about that from time to time, I kept/keep giving; telling myself that it will pay in the long run. But at times – especially when he has one of his more difficult days – I just think, babies grow up no matter what I do, so why should I invest my precious time anyway!!! *angry, unreasonable fit*. It is on those moments that my learning network can come up with answers that south my soul, telling me it does make a difference and that no matter how intense raising a baby can be at times, investing and nurturing life is the best option no matter what. Luckily for my son, my partner is the one really giving at this moment – at home 24/7. Always there, almost always patient and with a remarkable – truly remarkable – sense for stimulating the cognitive brain of our preciously young baby (she’s a teacher at heart). Learning him to grab, crawl, speak on the basis of a never relentless stream of examples and motivational acknowledgment when our son takes action. Alison Gopnik was the one enlightening me this October morning. She works on the subject of cognitive development and draws on psychological, neuroscientific and philosophical works to create and prove her own research findings. She is a professor at Berkeley. How is it possible that babies know so much more then we think they do? The answer lies in evolution. There is a relationship between the duration of the childhood of a species and how big the brain is of that species. Crows, rooks… are very smart birds (like chimps), they have a longer lasting childhood than for example chickens. And when looking at these two species the crows are much capable of solving complex dilemma’s then chickens. So the duration of childhood is the connection to knowledge and learning. This also means that evolution had to come up with a solution to allow learning to happen along many years before autonomy steps in. This might be why children are so dependent for such a long time (in general and looking at western society). A revolution has been taken place in the understanding of our brains and how it evolves. This is based on findings of reverent Bayes on machine learning (based on probability theory) and started from why scientists come to results, and he put it in a mathematical model.Babies use the same mathematical model: babies make complicated mathematical equations that allow them to distill how the world works. To proof this hypothesis, Alison did some simple preschool statistic tests (with four year old's). In a short time, the 4 year old's found the correct probability measure, and they use these results to shape their world. The interesting thing here is that 4 year old's actually are better at finding improbable theories than adults do (GREAT stuff!). Children actually do experimental research, but it is called ‘playing’. Adult cognition is different from child’s cognition, as the adults are much less open, very focused, purposed driven span of attention. Children are less focused, but more open, holistic information intake. So they are flooded by synapse dynamics. Until you have done all that learning, you are vulnerable. Evolution enables us to learn. At times adults consciousness can expand and meeting the children’s consciousness: this happens when we are in a completely new situation (in love in Paris after 3 double espresso’s). So if we – as humans want to achieve the openness of mind that will enable us to come up with new hypothesis in a matter of instants, we – as adults need to think more like children again. The Mother of all Massive Open Online Courses (MOOCs), the so called Change11 is well on its way and the course keeps generating amazingly good content. The latest slidecast is offered by Allison Littlejohn director at the Caledonian Academy and she talks about Connected Knowledge and Collective Learning. The really interesting part here is that she does not only describe what it is, but also how we - as members of the contemporary knowledge society - can learn (or should I say better learn?) to cope with the abundance of content that is created. This is a nice mLeanring journal to send your papers to (short and full papers). Great new issue with topics on mobile gaming, mobile collaborative learning design, mobile learning performance support, language learning and other. At the end you can also find two calls for papers, one is for a special issue of iJIM on the topic of VANETS (combination social computing and cars/vehicles). International Journal of Interactive Mobile Technologies (iJIM) has just published its latest issue at http://www.i-jim.org. We invite you to have a look at the Table of Contents here and then visit our web site to read articles and items of interest. Blogphilosophy: Do I/we act upon Steve @Jobs’ words or am I only nodding but not acting for #change? There is something that happens when people get their death certificate. When Steve Jobs addressed the Stanford students (http://www.youtube.com/watch?v=UF8uR6Z6KLc) he got a lot of one-liners out: “Your time is limited, so don’t waste it living someone else’s life” and “Sometimes life hits you in the head with a brick. Don't lose faith. Stay hungry. Stay foolish”. A lot of us nodded when we heard those words and we think “yes man!” but do we act upon this call for action? Do I act upon it, or do I simply keep seated in my chair, behind the same desk I have seen for 5 consecutive years? Do I take what I have learned in these past few years and move towards a new, personal knowledge action goal? Will I live my life? Will you? Randy Pausch had the same urgency to get some meaningful thoughts out there, when he knew he was on the verge of dying (see his last lecture here http://www.cmu.edu/randyslecture/ ). His main idea was, never accept a NO for an answer and to live your dreams. He dreamed and through his actions he created, just like Steve Jobs did. Do I live my dream? Was my dream to listen to others simply because this keeps me in a safe place? Or do I act upon the nod I gave when I heard Randy Pausche’s speech? The thing is, I am a nice person. I want to be nice, friendliness does not come natural to me, it is a choice. The only thing is, I am beginning to wonder whether this choice was/is not merely an excuse not to step on anyone’s toes… maybe I deluded myself that nice would keep me safe from harm and it would get me somewhere. Being nice, simply keeps me in a non-threatening space, but then… non-threatening spaces never got my mind into a mental high. Am I really happy to live without a higher goal? To simply earn enough money to make my life comfortable? Thinking about this makes me feel so … grey, so part of a grey, robotic like commuting group… I cannot help myself to remember the movie Brazil, in which bureaucracy is so well depicted. Shifting papers in the illusion to be part of something bigger… but when the boss no longer looks, shift to bread and games for comfort. So who am I? I am in the mainstream, working for a company whose major focus is not on education, but on health research which is a wonderful thing, but ... unless you are a doctor, I will not move beyond a certain echelon. I travel to conferences at occasions, giving speeches which I like… but I have the feeling I never move beyond this mainstream flow of consciousness, however, my heart and head want to, they are hungry for it. At times – in the past - I got myself out there on a limb and … that felt good. But the last few years I seem to have lost the courage (not the urge!) to position myself out there on the edge. I feel that if I stay at this mainstream space that I build for myself, I will never accomplish anything which will satisfy my heart and soul… dying soulless is not something to look forward to. The only thing is: what would be meaningful in learning? What do I belief that needs to be changed? Or is this question yet again a simple excuse, whispered in my ear by the demon that wants to keep me in the same place, for years, so change would never happen? How are your demons doing after thinking about death, after listening to Steve Jobs? When calls for papers enter my mailbox, I organize them and ... 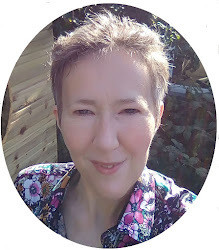 I decided to share them on a regular basis (lets say once a month), hoping to meet up with this wonderful eLearning network that roams the globe. Read the submission instructions and submit your proposal today. When and where: A Grant for 18 months, you need to live in the country for which you put in a proposal. Proposals for research projects on Information Societies and Information and Communication Technology for Development (ICTD) carried out in the Global South will be accepted. Applicants must register by October 14, 2011 via email at sirca2@ntu.ed.sg prior to submitting a proposal application. Deadline for submissions: 26th October 2011. Submissions for *Face-to-Face* or for *Virtual* Participation are both accepted. Both kinds of submissions will have the same reviewing process and the accepted papers will be included in the same proceedings. The focus of eLA 2012 will be on education, development and sustainability. For more information on the specific themes, please click here. Details about the Call for Papers 2012, such as information on submission requirements and deadlines, session formats, as well as the proposal forms can be accessed here.